Ever since time immemorial, man has kept pets; may they be dogs or cats, we love them all. But the fact of the matter is “how do we make sure we don’t end up hurting them with our wooden flooring?” Does it eventually mean that pet owners can never own wooden flooring? The idea is not as grave as it sounds. Bamboo flooring: Given its hard texture, durability, and extensive veneer, bamboo flooring is able to withstand any kinds of scratches and extra force. Every pet owner would sooner or later realize the importance of having a floor which is stain resistant and easy to clean. Since bamboo is biodegradable and eco friendly, it adds a lot many advantages to a home owner’s kitty. Since it is the hardest and the most durable solid oak flooring option in the market, a lot of home owners usually consider it as their first choice of flooring. Many dog and cat owners often face a challenge with their pets’ long nails; long nails mean more scratches and more wear and tear for the flooring. However, bamboo definitely rises above all such problems and proves to be a durable option for people who don’t want to do away with their four-legged friends. At the time of purchase, it’s advisable to opt for the strand woven bamboo, since it’s considered to be one of the sturdier varieties. 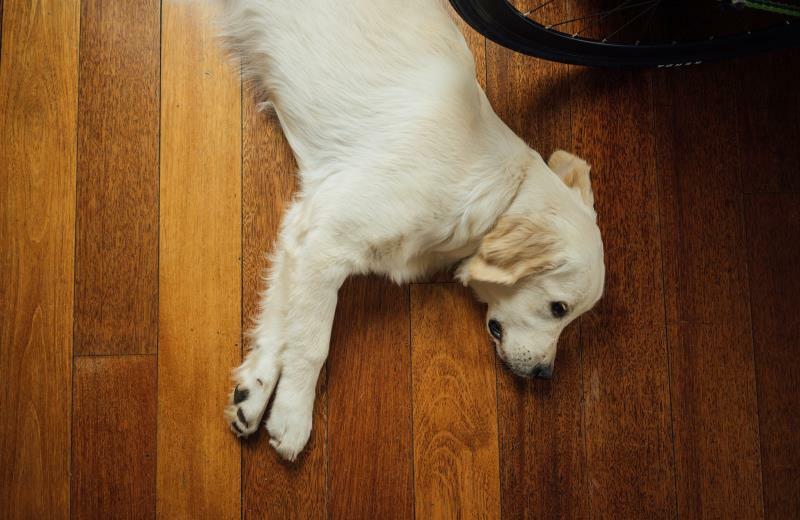 Cheaper bamboo flooring can often fall prey to your energetic pets and eventually give way. For best results, talk to your flooring provider for the best possible bamboo options available in the market. Laminated Flooring: Laminated flooring has its own charm inside a beautiful décor. But if your laminated flooring is your most prized possession, chances are that your dog/cat might also have taken a fancy to it. Cats love scratching shiny surfaces; if you have laminated flooring, you might be already facing the brunt of their love for the inanimate flooring. At the same time, laminated flooring is not a very preferred option for pet owners. In the long run, you might begin to notice that there are strands of hair stuck between the planks. In this scenario, you might have to end up getting a portion of the flooring changed, which will add to the overall costing of your flooring. Dogs usually face a lot of challenges when walking on slippery flooring. The glossy veneer of laminated flooring will cause your dogs to lose their grip on the floor, making them skid and trip all the time. Last but not the least, with your pets, there is always a chance of an accident happening inside the house. This can inadvertently mean that there might be a spillage on the floor, which can seep into the cracks of the flooring and cause the planks to grow in size. This would again end up burning a hole in your pocket, since the portion of the affected flooring would need to be replaced or refinished by an expert. Bamboo flooring is recommended for pet owners; however, on the other hand, it’s advisable for pet owners’ to refrain from using laminate flooring for the many drawbacks listed above.